The DPSS OEM series - G & W Machinery Sales, Inc. The DPSS OEM series are the most advanced and reliable industrial-grade, diode-pumped laser marking systems available on the market today. With a host of configurations and options, the OEM series are ideal for integrating into an assembly line with or without a PC. With wavelength choices of 355, 532nm (green) or 1064 ( IR) you can be sure that Vytek has a laser marking system configuration that is right for you. Integrated designs with laser, laser control and power supplies are enclosed in a single housing and, depending on the laser choice, a remote amplifier and fiber delivery are available as options for tight space applications. The DPSS OEM series is available in Q-switch or CW configurations and in 2, 5, 10, 20, 50, 100 watt output power options depending on your wavelength choice. 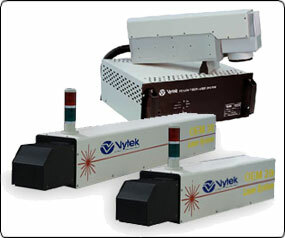 Contact a Vytek representative today and learn more about the OEM Fiber laser marking series.